STAR TREK – FIVE YEAR MISSION is a cooperative dice-rolling board game with a heavy thematic tie to both Star Trek: The Original Series (TOS) and Star Trek: The Next Generation (TNG). 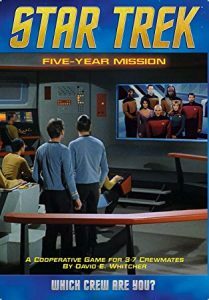 Star Trek: Five-Year Mission is a cooperative dice placement game for 3-7 players who take the roles of crew members of either the USS Enterprise (from the original Star Trek series) or the USS Enterprise-D (from Star Trek: The Next Generation). Each crew member has a different ability and the crew’s abilities differ for each crew. In these roles, players try to cooperatively solve a series of blue (easy), yellow (medium) and red (difficult) alerts to score points, attempting one of 6 different difficulty levels to win before failing five such alerts, or the Enterprise being destroyed. Players must deal with injuries which lock dice out of play, ship damage that can force players to attempt harder alerts, urgent events that must be completed in 3 minutes, the prime directive, as well as yellow and red alerts that force additional alerts cards to come into play pushing you closer to failing. This board game’s mechanic is similar to other dice placement games like Roll For It and Elder Signs. It is very easy to learn the basics, which allows players to jump into the game quickly. You don’t have to be a Star Trek fan to either play or enjoy the game. But, if you are not a Star Trek fan, shame…shame…shame! Watch one of the videos below to see how to play the game.